As you read the title, what were your first instinctive thoughts? Where in the world is Vietnam? Depending on your age you may have immediately thought of the horrible atrocities of the 10-year war that the US was part of in this small Asian country. A war for freedom that ultimately was lost to communism. Or perhaps your immediate thoughts were a restricted, communist, closed to the gospel country. All the above facts are true, but what about Vietnam today? Where in Southeast Asia is Vietnam? The gospel first came to Vietnam in the early 1900s but it really did not gain much attention until during the Vietnam war. Numerous Vietnamese Christian brothers have told me they are grateful for the American army chaplains who first brought the gospel to their specific regions of Vietnam. If this is true, it most certainly is a good side of a war that appeared to be lost & unnecessary. God truly is a God who can transform tragedy into triumph! Blessed be God! Today Vietnam has a population of 96 million people made up of 118 different ethnic people groups. Only 2.23% of the population are evangelical Christians (Joshua Project Statistics). Therefore, Vietnam is largely a gospel unreached nation. Thank you so much for your coming and training our local leaders. Praise God for such a wonderful conference we had with pastor Raymond and MTM team. The subject they taught is Servant Leadership. It is a very important and timely subject. Our leaders are very much encouraged and build up in the faith. They took it seriously to hear Pastor Raymond and MTM guest teacher, Roy Ulrich. Many of them this is the first time to hear such a subject. We need more training like this. We give thanks to God for MTM and precious teaching like this. This not only biblical but also practical. The above paragraph is written by David, who coordinated the conference for MTM. 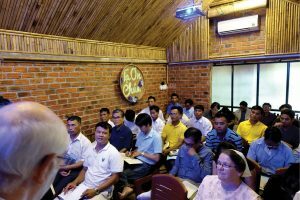 The Lord opened the door for MTM to commence a pastoral leadership conference June 26-28 in DaNang, Vietnam. 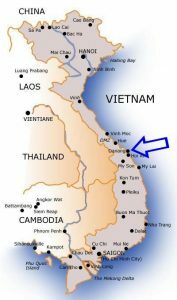 DaNang is centrally located just south of where the former border was located between North & South Vietnam. It was in this region where some of the most intense fighting of the Vietnam war took place. What a joy and a privilege to meet with 30-35 Vietnamese, good soldiers of Jesus Christ who have a heart to follow their commander in chief, JESUS CHRIST to fight another war for the souls of men of their own country. Some attendees came from as far away as 650 kilometers (400+ miles), others came from 400 kilometers away (250 miles), still others came from 180 kilometers away (100+ miles), and others in attendance were more local to the area. Of those people, there were 4 primary groups of people represented, each having different language dialects, yet all understood the Vietnamese national language that our interpreter translated our messages into. In the book of Acts we find the early church waiting in an upper room for the promised Holy Spirit to come and fill them and empower them to be a witness for Jesus Christ. In Vietnam morning by morning the 30-35 attendees all squeezed into a very small (11X16 feet) inner room within a larger public coffee shop. And there with all the doors closed and locked the Lord once again truly visited his disciples. 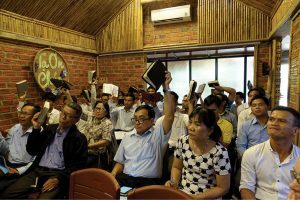 The Spirit of the Lord’s empowerment came forth from the Word of God to be a dynamic witness for Jesus Christ in this basically gospel unreached nation of Vietnam today. The attendees holding up their Bibles, and holding up Jesus Christ in a dark country! Brother Raymond taught on Leadership Priorities and I (Roy Ulrich) shared a variety of messages on Lessons from the Life of Christ, God’s Divine Order of Authority, and Husband and Wife Relationships. The people were very attentive and hungry for the truth of God’s word. They responded with a loud amen and nodding their heads in affirmation to the truths being shared. The conference ended with an invitation to commit to a deeper walk with God. It seemed that every soul in attendance responded. Brother Raymond and I went around to each person praying over them and for them as they too cried out to God in supplication and in weeping to give themselves in a deeper and fuller way to the work of furthering the kingdom of Christ in Vietnam. What a beautiful time of worship it truly was. May the Lord Jesus build his church in Vietnam! Editor’s Note; The above article was written by the MTM teaching team (Raymond & Roy). Roy & Nancy Ulrich traveled all the way from Ephrata, PA to serve the Lord with MTM as a guest teacher. Brother Roy serves as one of the ministering elders at JOY Christian fellowship at Ephrata, PA. Thank you Roy & Nany for giving of yourselves to serve the Lord with MTM. May the Lord reward you openly for your faithful ministry of God’s Word unto the Vietnamese Leaders. Note: when viewing picture in Google Photos, click the “i” in the top right side of your browser to view captions of the pictures! !